Indeterminate. Potato Leaf. 85 days. 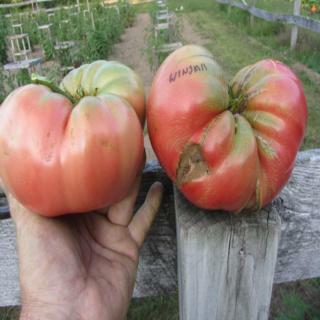 Huge rose-pink beefsteak type. Our strain is different than some other strains out there. There were none under three pounds in our 2012 gardens.. Production is above average. Will produce until frost. Originally an improvment on Ponderosa Pink from Henderson Seed Company. Tasty and meaty giants grow easily to large size. * Competition tomatoes are six seeds.